Today, we have become the passive consumers of media. Specially, when we talk of social media, we don’t even think twice before sharing anything. We are least bothered when it comes to verifying whether actually the content is worth sharing or is just a cool edited piece for showbiz. We accept the content as it is, proving ourselves media illiterate. Cannot say much about the mentality of those who make such messages, but accepting and sharing a seven headed snake’s(“sesh naga” in Hindi)image as a tool of worship, and associating it with Lord Vishnu clearly states that we are least bothered about confirming the authenticity of the news at least once before accepting it. The image was shared all around the net, specially on Facebook and thousands of comments and likes were made on that content. Also as it was widely shared, some of the posts’s caption were; “please comment ‘ and do share the image, The Real shesnag found in Himachal, India etc. Also it was shared on you tube. 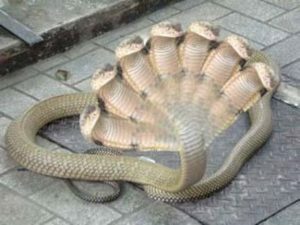 One of the video was captioned as, “Viral Sach: Is this a 7 headed snake?”. The video featured ABP’s news anchor describing about the image. It was liked by more than 12K(12000) people and had around 533 comments. The video was published by the channel “ABP news” which had 6M(6 million) subscribers. As the news got viral not only on various social media sites like Facebook and You Tube, but also was later telecasted by The ABP news clarifying the truth, it can clearly be said that media today has gone too far and had became a tool for misguidance than just a tool for entertainment and information. As the edited photo circulated a long way, it got publicised on a level that was beyond exceptance. Today, we the people of 21st century need to realize the importance of checking the authenticity of the news before sharing any piece of information, specially from social media sites or other such sources. We should be able to differentiate between a publicty material and an authentic news. One Response to "Hoax News: Publicity Material?"